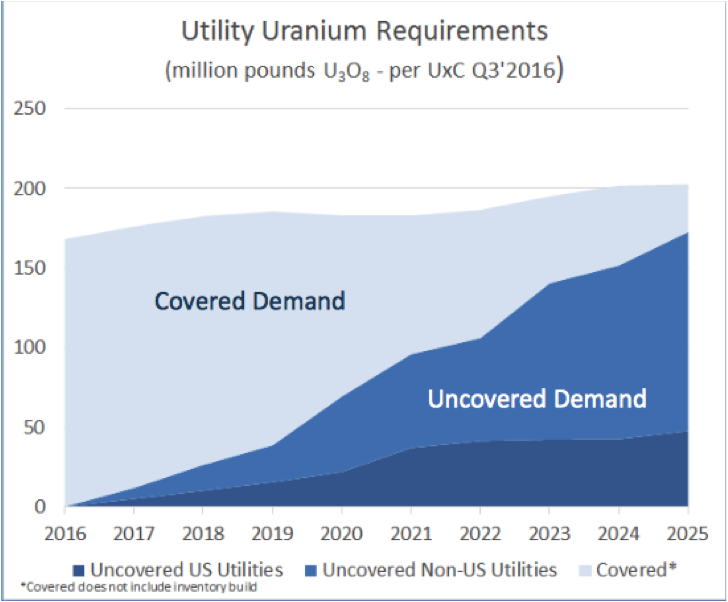 Uranium Collapse Signals 2020 Supply Shock: GoviEx CEO | Energy and Gold Ltd. The spot uranium price has now fallen over 85% from its 2007 peak and is at a level not seen since mid-2004. The uranium market is showing all the signs of a cyclical industry suffering a post-party hangover — except this was an all-weekend party session. However, there are indicators that negative factors influencing the industry will soon be removed, laying the groundwork for the return of a stronger market. The one key factor that underpins any cyclical industry is demand. And the evidence is clear: there is robust future growth in nuclear energy. China and India are providing solid reactor build programs, the U.S. and Europe have come to realize that nuclear energy has to be part of a clean energy basket, and even Japan has indicated that reactor restarts are going to continue (albeit slowly). Uranium prices are now down to under US$19/lb U3O8, compared to US$137 at the 2007 peak. Analysts with major brokerage houses estimate more than half of uranium-mining companies are producing uranium at an operating loss, and none of them are covering their total costs (including costs of capital). Basic economics dictates that a commodity cannot stay below its cost of production for an extended length of time. There are two factors that account for the current price weakness, but both are short-term and likely to unwind quickly in the next 2 to 3 years. In other words, 2020 remains the major inflection date. The two factors weighing heavily on the uranium market at the present are i) inventories and ii) under feeding. Inventories have suddenly become the ‘talked-about’ issue, especially since the World Nuclear Conference in London this past September. That’s where Ux Consulting (UxC) presented its opinion that above-ground stocks of uranium stood at 1.4 billion lbs. Viewed on its own, that’s a large and rather frightening number. But when it comes to inventories, context is important. Since 1985, the demand for uranium has been met by supplementing continued historical under-production by the mines with inventories built up before 1985. Total inventories were there — in fact, they were higher — when the uranium price peaked at over US$130/lb in 2007, and again in 2011 when spot uranium went over US$70/lb. So clearly, it’s not total inventories that are the problem. According to data from the Organisation for Economic Co-operation and Development (OECD), current total inventories are about half the level of their 1991 peak. The issue that the industry is grappling with now is that most inventories are currently held with the utilities — the main consumers of uranium. Their uranium inventories, combined with their long-term contracts, means their short-term requirements are being met. 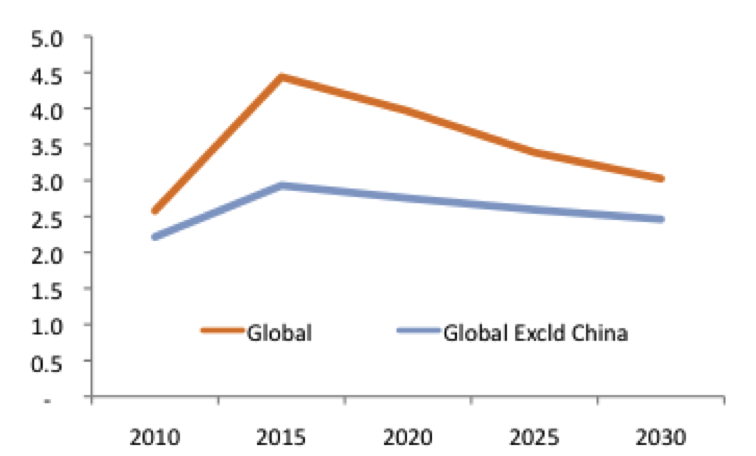 Globally, utilities are reportedly holding about 770 million pounds of U3O8, compared to current annual demand of 174 million pounds. This equates to 4.4 years of demand. However, China is estimated to hold approximately 40% of this inventory. And it’s not surprising that China is building its inventory, given that the country plans to grow its nuclear energy generation from the current 30 giga-watts of electric capacity to 130 GWe by 2030 (and 240 GWe by 2050), according to the World Nuclear Association (WNA). Exclude China from the inventory position and the rest of the nuclear world is currently holding about 2.9 years of demand. Historically utilities have sought to hold between 2 and 3 years in inventory. So current inventory levels are high, but within the historical range. Context is also important for this level of inventory. The utilities consume enriched uranium in their reactors. The cycle time for mining uranium out of the ground, shipping it to enrichment facilities, enriching it and then creating fuel rods from the enriched uranium is 2 – 3 years. Current stockpiles at utilities are not excessive given the enrichment cycle. The fly in the ointment on inventories is Japan, which we understand continued to honour its long-term contracts and buy and build inventory, even though its reactors were shut down. Japanese utilities are holding 60-80 million pounds more than they need, even if they restart their reactors. Offsetting that is India, which is reported to hold an inventory of 3 million pounds and plans to build that to 39M lbs by 2025, providing a strategic stockpile. According to the World Nuclear Association, India had 5 GWe in nuclear generation capacity in 2014, which will increase to 17 GWe in 2024 and 63 GWe in 2032. The American and Russian governments continue to hold large inventories, but these are over 70% in the form of depleted uranium — uranium that has been through the enrichment process once before. Planned or prospective mines require much higher uranium prices to justify their construction. If you exclude that potential supply and look at the forward supply and demand curve, you can see why utilities are building inventory. We are also coming to the end of an era as some of the most well-known uranium mines – Rossing, Areva’s mines in Niger and Cigar Lake – are forecast to run out of ore reserves between now and 2030. That doesn’t include any premature closes caused by the current low uranium price. Some have claimed that China’s demand will disappear because the massive Chinese-owned Husab mine in Namibia is coming on line. However, Husab’s production is included in the above supply curve. And if China is taking the material, then it’s not available to anyone else. No wonder then, that the utilities have been building inventory. That brings us to the second major issue impacting the short term uranium market – underfeeding. Nuclear reactors use uranium-235 (U-235) to generate electricity. U-235 makes up only 0.711% of “natural” mined uranium (U-238), hence uranium needs to be enriched from 0.7% to 3-5% U-235 to make reactor fuel. The enrichment process simply put uses centrifuges to separate the lighter U-235 molecules from the heavier U-238 molecules. The enrichment process is capital intensive and inflexible (the centrifuges cannot just be turned on and off). According to WNA estimated currently total enrichment production capacity is about 58.7 million SWU (Separative work units), well above the 47 million SWU of annual demand. As centrifuges spin or shut permanently, the excess capacity maximising U-235 recovery (underfeeding) reducing the demand for U3O8, and resulting in the build-up of Enriched Uranium Product (“EUP”) inventories. The long-term SWU price for the majority of long-term (10 year) contracts set in 2009-2012 was in the $148 to $164 range. These contracts are due to close in the next 2-3 years. As enrichers have minimal cost related to underfeeding, they tend to be price-takers and are happy to sell on the spot market for whatever price they can get. The spot SWU price as a result has fallen to $49. Therefore, while enrichers can continue to deliver against their high-priced legacy contracts, they can still afford to sell excess material into what is an increasing lower spot price. Their average price received still likely to be high enough cover their costs. These actions have placed downward pressure on the SWU price and the uranium price. So what happens to the enrichers during 2019 to 2021, when their high priced long term contracts end and the spot SWU price is down at $49? Surely excess enrichment capacity will have to be removed, reducing underfeeding and EUP stocks. Urenco and Tenex account for approximately 70% of enrichment capacity, and have both announced plans to reduce their capacity. Reducing this capacity should help to reduce SWU production, reducing EUP inventories and importantly reducing the potential for underfeeding. While the current uranium market has capitulated with a collapsing uranium price, the future is starting to look better, with the majority of negative pressures expecting to be removed in the coming 2-3 years, and the potential for strong demand continuing, but with supply constraints instead. New uranium production will therefore be needed at the turn of the decade, and there are few ways to play this change in fortunes. One example is GoviEx Uranium Inc. (“GoviEx”), of which I am CEO and a Director. • A strong shareholder base, including Denison Mines, Ivanhoe Industries, Toshiba Corporation and Cameco Corporation. • A growth Africa-focused uranium company with a defined project development pipeline and jurisdictional diversification. • Further exploration potential, with several drill-ready targets defined at each property. • Mining permits granted in Niger and Zambia, both recognized mining countries with good infrastructure and long mining histories. • Significant metallurgical test work and engineering studies completed on its development assets, providing GoviEx with an opportunity to build a strong development pipeline. The views and opinions expressed in this article are solely those of the author, Daniel Major. They are subject to change, and no forecasts can be guaranteed. The comments may not be relied upon as investment advice or a recommendation to buy or sell a security. This article may contain forward-looking information within the meaning of applicable securities laws. All information and statements other than statements of current or historical facts contained in this article are forward-looking information. Such statements and information may be identified by words such as “about”, “approximately”, “may”, “believes”, “expects”, “will”, “intends”, “should”, “plans”, “predicts”, “potential”, “projects”, “anticipates”, “estimates”, “continues” or similar words or the negative thereof or other comparable terminology. Forward-looking statements are subject to various risks and uncertainties concerning the specific factors disclosed in this article. Information provided in this article is necessarily summarized and may not contain all available material information. Forward-looking statements include, without limitation, statements that reflect projections or expectations of future financial or economic performance of the uranium markets, statements regarding expectations that negative factors influencing the uranium industry will soon be removed, laying the groundwork for the return of a stronger market, the expected robust future growth in nuclear energy, the expected long-term demand for uranium to increase as world government trend towards developing balanced energy supply strategies that include nuclear energy, the expectation that current price weakness is likely to unwind quickly in the next 2-3 years with due to depleting inventories and reduction of underfeeding, , there being no new producers anticipated to begin operations in the near term other than China, the expectation that 40% of all long-term contracts will be uncovered by 2020 creating a long-term demand increase and a long-term supply decline, the amounts of known uranium inventories. Forward-looking statements are based on a number of assumptions and estimates that, while considered reasonable by the author, based on the author’s experience and knowledge of the uranium industry, are inherently subject to significant operational, economic and competitive uncertainties and contingencies and the expectation that GoviEx will become a significant uranium producer through the continued exploration and development of its flagship mine permitted Madaouela Project in Niger, its mine permitted Mutanga Project in Zambia and uranium-copper-silver exploration Falea Project in Mali. Assumptions upon which forward looking statements are based include an impending depletion of uranium inventories giving rise to increased demand and an increased uranium price, the long-term fundamentals of the uranium market remaining strong thereafter, the anticipation that the reported life of mine of existing producers will not change and that there will be no new producers entering the market in the near term that will significantly impact the uranium supply, the amount of known uranium inventories are accurate, the continued trend of governments towards developing balanced energy supply strategies that include nuclear energy will grow, that no new renewable sources of energy will enter the market that are as or more efficient and/or green than nuclear energy, that GoviEx will continue to enjoy the support of a strong shareholder base and develop its projects successfully. Important factors that could cause actual events and results to differ materially from the author’s expectations include those related to market fluctuations in price, inventories, production and consumption of uranium; the lack of political will by government to implement balanced energy supply strategies that include nuclear energy; changes in regulatory regimes governing the extraction of uranium and its use. In addition, the factors described or referred to in the section entitled “Financial Risks and Management Objectives” in the MD&A for GoviEx for the year-ended December 31, 2015, available at www.sedar.com, should be reviewed in conjunction with the information found in this article. Although the author has attempted to identify important factors that could cause actual results, performance or achievements to differ materially from those contained in the forward-looking statements, there can be other factors that cause results, performance or achievements not to be as anticipated, estimated or intended. There can be no assurance that such information will prove to be accurate or that the author’s expectations or estimates of future developments, circumstances or results will materialize. As a result of these risks and uncertainties, the results or events predicted in these forward looking statements may differ materially from actual results or events. Accordingly, readers should not place undue reliance on forward-looking statements. The forward-looking statements in this article are made as of the date of this article, and the author disclaims any intention or obligation to update or revise such information, except as required by applicable law. Cautionary Note to United States Investors: This article and the disclosure contained herein does not constitute an offer to sell or the solicitation of an offer to buy securities of GoviEx Uranium Inc.